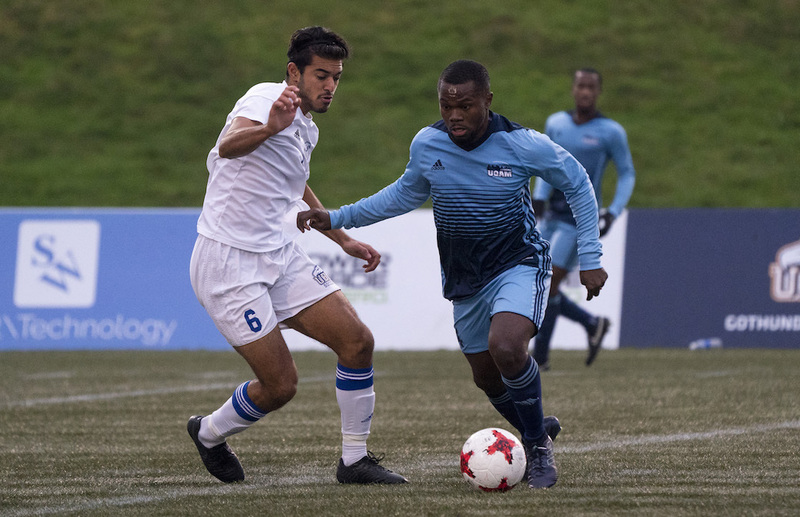 The UQAM Citadins earned a hard-fought 2-1 win over the host UBC Thunderbirds in Friday’s second consolation round semifinal, as Mohamed Saidi buried a brace on a pair of penalties in a contest that featured a combined 30 fouls and three red cards. UQAM came within an inch of striking first, 12 minutes in the game. After UBC had controlled the run of play for much of the early stages, Ibrahima Malick Ndiaye made a run onto a long ball from defender André Bona. The fourth year attacker broke behind the UBC defence and his volley beat UBC keeper Chris Hansen-Barkun, but clanged directly off the left post. The 26th minute saw a nice little run from fullback Dallin Akune, as the sophomore kept his mark at bay with some quick footwork down the left flank, creating enough space to whip in a cross that was snared by Simon Beauregard-Barrette. Zach Verhoven, who had three shots in the first half by himself, broke off several dangerous chances for UBC in the closing minutes of the frame. Verhoven nearly struck first after chasing down the loose ball, but his first touch was a bit too strong as he broke in alone. A controversial penalty call got UQAM on the board seven minutes into the second stanza, as Hansen-Barkoun was called for colliding with midfielder Jules Kuhn in the Thunderbirds box, though the replay appeared to show that the UBC keeper made contact with the ball before he made contact with Kuhn. Saidi stepped to the spot and beat Hansen-Barkun to the lower left corner. The Thunderbirds wasted almost no time responding. On a free kick in the 54th minute, midfielder Jora Soran delivered a perfect ball from the right flank. Connor Guilherme timed his jump perfectly, and the defender went crossbar down with his header, slotting it in behind Beauregard-Barrette. Another Hansen-Barkun challenge at the edge of the box led to a second penalty for Saidi, and the midfielder delivered a well-placed strike to the top right corner to put UQAM back up 2-1 in the 65th minute. M⚽️ // Congratulations to the Players of the Game from the second @USPORTSca consolation semifinal! Saran and Guilherme nearly connected again just two minutes later, as the former’s corner from the right found the latter, but Guilherme’s header went just wide past the left post. With UBC unable to find the equalizer, the game turned ornery in the late stages. 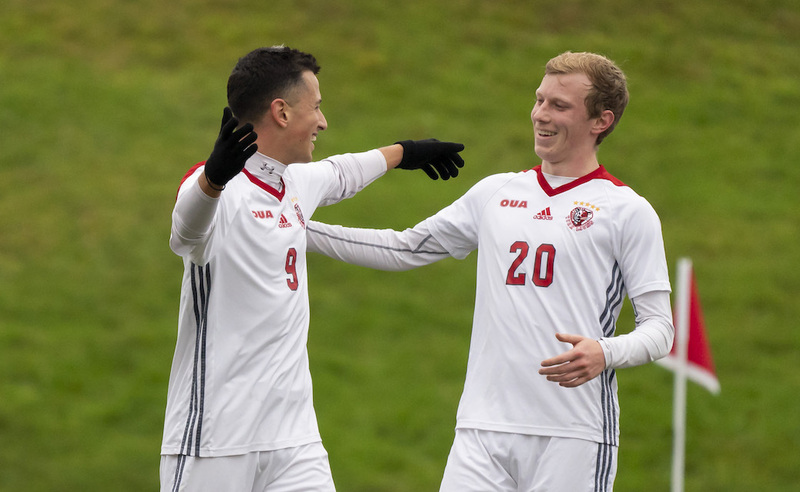 Approaching stoppage time, Thunderbirds star midfielder, and U SPORTS Rookie of the Year, Thomas Gardner was shown a red card after trying to recover his dribble with a slide tackle that clipped Michael Chatel, as the freshman’s studs made contact with the UQAM veteran’s thigh. Nick Fussell was ejected shortly after a late challenge on Kuhn. Ndiaye was also thrown out on the ensuing scuffle. "It was a very physical game,” said Dutarte. “I didn't expect things to go that way, but I'm happy with how the guys managed their emotions. We'll be ready tomorrow for the fifth-place match." Next up, UQAM are set to take on the York Lions in the consolation final Saturday afternoon, with the two sides set for a 4:30 pm ET / 1:30 pm PT kickoff.